Friday, June 3 and Saturday, June 4, 2011: Veterans Memorial Stadium @ UW-La Crosse. Results. To qualify for the Wisconsin Track Coaches Association All-State Team, athletes had to finish in the top six for all three divisions combined in the finals at the state meet 2011. 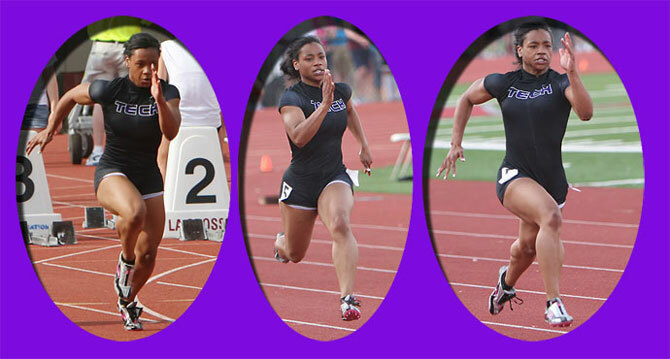 In addition her performances at the 2011 WIAA State Meet left her among the elite of USA high school dash athletes. 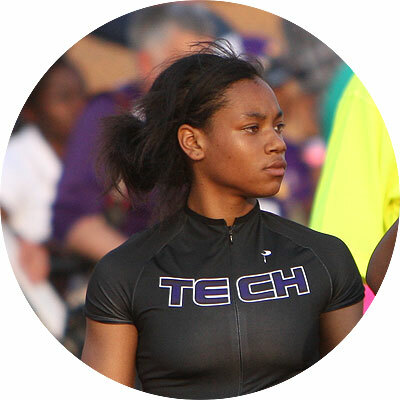 Her times of 11.38 in the 100m dash and 23.01 in the 200m dash were the #2 times in the USA for the 2011 high school season. Bryant who led Milwaukee Bradley Technical High School to its third D1 State Championship attends Clemson University [2012 update] on a track scholarship. 100 Meter Dash: 1. Dezerea Bryant (Milwaukee Bradley Technical), 11.38; 2. Tahje Whittley (Milwaukee Bradley Technical), 12.08; 3. Heather Bong (Arrowhead), 12.10; 4. Chidera Obasih (Brookfield Central), 12.11; 5. Deysha Smith-Jenkins (Dominican), 12.13; 6. Eileen Gehring (Madison Edgewood), 12.18. 200 Meter Dash: 1. Dezerea Bryant (Milwaukee Bradley Technical), 23.01; 2. Elexis Fuller-Stewart (Milwaukee Bradley Technical), 24.08; 3. Deysha Smith-Jenkins (Dominican), 24.64; 4. Chidera Obasih (Brookfield Central), 24.78; 5. Eileen Gehring (Madison Edgewood), 25.00; 6. Kat Keller (New Richmond), 25.15. 400 Meter Dash: 1. Bonnie Draxler (Wrightstown), 56.28; 2. Eileen Gehring (Madison Edgewood), 56.45; 3. Chidera Obasih (Brookfield Central), 56.58; 4. Tahje Whittley (Milwaukee Bradley Technical), 56.86; 5. Crystal Malone (Milwaukee Riverside), 57.01; 6. Taylor Naatz (Watertown), 56.91. 800 Meter Run: 1. Alison Parker (Neenah), 2:12.36; 2. Andie Zeman (Arrowhead), 2:13.76; 3. Taylor Zimprich (Waunakee), 2:13.80; 4. Bridget Murphy (Seymour), 2:14.13; 5. Madeline Haupert (La Crosse Aquinas), 2:14.61; 6. Vanessa Boorse (Wausau East), 2:14.71. 1600 Meter Run: 1. Molly Seidel (University Lake School), 4:51.54; 2. Andrea Ostenso (Ladysmith), 4:54.20; 3. Allie Woodward (Green Bay Notre Dame), 4:54.25; 4. Paige Peschel (Westfield-Montello), 4:58.76.; 5. Tricia Serres (Platteville), 4:59.11; 6. Madeline Haupert (La Crosse Aquinas), 5:01.93. 3200 Meter Run: 1. Allie Woodward (Green Bay Notre Dame), 10:11.48; 2. Molly Seidel (University Lake School), 10:33.15; 3. Andrea Ostenso (Ladysmith, 10:35.25); 4. Liz Berkholtz, Sun Prairie, 10:52.76; 5. Haley Johnson, Plymouth, 10:53.23; 6. Allie Fons, Franklin, 10:53.88. 100 Meter Hurdles: 1. Elexis Fuller-Stewart (Milwaukee Bradley Technical), 13.89; 2. Marissa Savitch (Homestead), 13.98; 3. Cathy Brunette (Grafton), 14.88; 4. Valerie Thames (Milwaukee Riverside), 15.00; 5. Kim Drewiske (Green Bay Preble), 15.17; 6. Alli Divine (Madison East), 15.19; 6. Jaclyn Ditter (Monroe), 15.19. 300 Meter Hurdles: 1. Michelle Garner (Greenfield), 44.05; 2. Maya Carter (Racine Case, 44.06); 3. Valerie Thames (Milwaukee Riverside), 44.29; 4. Tess Nelson (Northwestern), 45.02; 5. Karlee Schneiss (Kettle Moraine Lutheran), 45.20; 6. Tessa Thurs (Edgar), 45.38. 4x100 Meter Relay: 1. Milwaukee Bradley Technical, 46.02 (Elexis Fuller-Stewart, Tahje Whittley, Angelina Howard, Dezerea Bryant); 2. Hamilton, 48.15 (Toney Lock, Brooke Patterson, Ashley Holicek, Danielle Barbian); 3. Hudson, 49.17 (Erikka Haft, Angela Tipp, Erika Tipp, Katie Thielmann); 4. Pulaski, 49.28 (Teagan Wernicke, Rachael Busjahn, Victoria Moss, Brittni Wirtz); 5. Arrowhead, 49.28 (Elizabeth Duchow, Vanessa Voss, Amanda Shober, Heather Bong); 6. Kimberly, 49.45 (Sam Blue, Erin Lang, Hayley Bruss, Alesha Malueg). 4x200 Meter Relay: 1. Hamilton, 1:40.63 (Ashley Holicek, Ellen Buckley, Brooke Patterson, Jess Rupnow); 2. Hudson, 1:42.03 (Erikka Haft, Angela Tipp, Erika Tipp, Katie Thielmann); 3. Arrowhead, 11:42.43, Elizabeth Duchow, Vanessa Voss, Amanda Shober, Heather Bong); 4. Kimberly, 1:42.58 (Sam Blue, Erin Lang, Hayley Bruss, Alesha Malueg); 5. La Crosse Logan, 1:44.21 (Amber Sanderson, Jenna Berger, Imani Paul, Grace Heglund-Lohman); 6. Waukesha West, 1:44.40 (Meghann Ameen, Caiti McCormick, Katie Corrao, Hannah Rohde). 4x400 Meter Relay: 1. Hamilton, 3:56.190 (Ellen Buckley, Ashlyn Paulson, Jess Rupnow, Brooke Patterson); 2. Onalaska, 3:57.85 (Jamie Burr, Maddie Hibshman, Maddie Johnson, Rachel Lukas); 3. Neenah, 3:57.94 (Alyssa Krueger, Jennifer Parker, Jessica Parker, Alison Parker); 4. West Bend West, 3:58.70 (Candice Wayne, Alexis Wolf, Krya Gudex, Erica Wanie);; 5. Kiel, 3:59.22 (Maxine Becker, Rosemary Mueller, Mikayla Preissner, Kristin Mathes); 6. Milwaukee Riverside University, 3:59.35 (Valerie Thames, Demetra Camble, Martayla Scott, Crystal Malone). 4x800 Meter Relay: 1. Neenah, 9:08.64 (Claire Knaus, Jennifer Parker, Jessica Parker, Alison Parker); 2. Arrowhead, 9:15.49 (Taylor McCormack, Teagan Seneczko, Taylor McDowell, Andie Zeman); 3. Onalaska, 9:21.47 (Maddie Johnson, Rachel Lukas, Maddie Hibshman, Jamie Burr); 4. Platteville, 9:23.21 (Caitilin Bartels, Laura Donovan, Julia Lawinger, Tricia Serres); 5. Brookfield Central, 9:26.55 (Elizabeth Stief, Maddie Fischer, Elizabeth Flatley, Hannah Trasser); 6. Homestead, 9:30.05 (Maggie Stolz, Alex Holtz, Keali Bjork, Lauren Holtz). Discus Throw: 1. Kennedy Blahnik (Algoma), 150-07; 2. KeKe Burks (Madison La Follette), 133-08; 3. Kailee Kamps (Belmont), 130-03; 4. Heather Clankie (Brodhead-Juda), 129-03; 5. Paige Day (DC Everest), 128-09; 6. Melanie Brickner (Marathon), 128-08. Long Jump: 1. Raquel Ebbe (Nekoosa), 17-11.00; 2. Sam Blue (Kimberly), 17-10.00; 3. Taylor Rosenfeldt (Little Chute), 17-09.75; 4. Micaela Creighton (South Milwaukee), 17-07.75; 5. Abby Scharbarth (Lakeland), 17-07.75; 6. Sierra Thomas (Hartford Union), 17-07.00. Triple Jump: 1. Bria Halama (Independence-Gilmanton), 38-05.00; 2. Kristin Heckel (Waukesha West), 37-09.25; 3. Rachel Stave (Whitnall), 37-06.50; 4. Marissa Schaber (DC Everest), 37-03.75; 5. Raquel Ebbe (Nekoosa), 37-03.50; 6. Tatiana Rice (Gale-Ettrick-Trempealeau), 37-01.00. High Jump: 1. Jenna Breaker (Tigerton), 5-06.00; 1. Audra Winter (Manitowoc Lutheran), 5-06.00; 3. Brooke Richardson (Verona Area), 5-05.00; 3. Jessie Welch (West Salem), 5-05.00; 5. Elizabeth Axell (Wrightstown), 5-04.00; 5. Fiona Baus (Bay Port), 5-04.00; 5. Kasey Ederer (Kaukauna), 5-04.00; 5. Ellie Grandi (Burlington), 5-04.00; 5. Sara Henry (Somerset), 5-04.00; 5. Meghan Niemann (Kettle Moraine Lutheran), 5-04.00; 5. Lauren O'Brien (Verona Area), 5-04.00. Pole Vault: 1. Alex Flucke (Ashwaubenon), 12-00.00; 2. Faryn Wirkus (Edgar), 11-07.00; 3. Cami Gilson (Arrowhead), 11-06.00; 4. Alex Douglas (Madison East), 11-03.00; 4. Bonnie Draxler (Wrightstown), 11-03.00; 4. Kim Stonewerth (Whitewater), 11-03.00; 4. Jessica Wiegert (De Pere), 11-03.00.